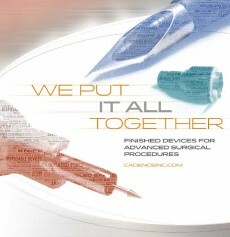 The final assembly of medical devices is only done in environments where there is no room left for error. These products often get assembled, packaged, labeled, sterilized, and are fed into distribution by a single OEM partner, so the level of ultimate trust needs to be extremely high for success. At Cadence, we created a separate and dedicated facility in PA to focus solely on this part of the supply chain. Our dedicated facility also contains a Certified ISO Class 8 (100,000) Cleanroom for the most extreme final assembly requirements. Our experienced team and robust quality systems stand ready to help in the final stages of your product development process. Contact us today to find out how WE PUT IT ALL TOGETHER for you!